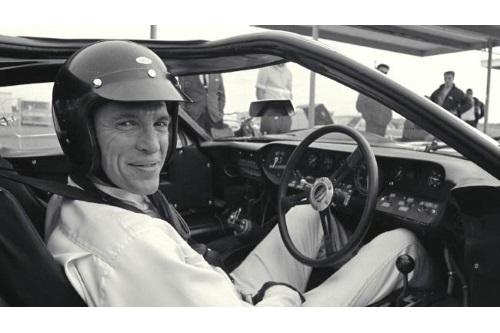 It is our very sad duty to inform Members of the death of the great American driver Dan Gurney who passed away on Sunday 14 January at the age of 86 due to complications from pneumonia. Universally popular, few drivers attracted the respect and affection which Dan enjoyed in his extensive career both at home in the USA and in Europe. In motor sport terms he was something of a renaissance man, excelling in all of the numerous branches of the sport to which he turned his attention ranging from Formula 1 through various types of sports car racing, stock cars and Indy cars. Such was his charisma that in the 1960s Car and Driver magazine initiated a ‘Gurney for President’ campaign. Dan was elected as an Honorary Member of the BRDC in 1960. Born in New York the son of an opera singer who moved to southern California on his retirement, Dan grew up exposed to the flourishing sports car scene. After serving with the US Army in the Korean War for two years, Dan soon began to make his mark in a Triumph TR2 and Porsche 356 Speedster so that by 1958 he had been invited by US Ferrari importer Luigi Chinetti to drive for him at Le Mans. That summer in Europe gave Dan the chance to experience a few other major sports car races which, combined with his increasing success at home, brought him an invitation to join Scuderia Ferrari in 1959 for both Formula 1 and sports car racing. In his second F1 race, the two-leg German Grand Prix on Berlin’s ultra- fast AVUS circuit, Dan was classified second in his Dino 246 behind team leader Tony Brooks. A move from Ferrari to BRM for 1960 took him from Italian politics to the English variety and it was not a happy season in Formula 1. However, with Sir Stirling Moss he won the Nurburgring 1000 Ks in a Camoradi team Maserati T61 Birdcage and, on his first visit to Brands Hatch, finished second to the emerging Jimmy Clark, both in Lotus Type 18s, in the Formula 2 Kentish 100. Having driven for Porsche in the F2 Solitude Grand Prix, Dan signed up with the German manufacturer for 1961 which brought him his best ever placing in the Drivers’ World Championship, joint third with Sir Stirling Moss behind the dominant Ferrari drivers Phil Hill and Wolfgang von Trips. The first of Dan’s four World Championship F1 race victories came in the French Grand Prix at Rouen in 1962 with the Porsche 804. Remarkably it was at Rouen two years later that Dan gave Brabham its first F1 World Championship race win, following this up with victory in the final round in Mexico. A return to Brands Hatch for the first F1 Race of Champions in March 1965 saw Dan and Jimmy Clark engage in a magnificent duel which ended when Jimmy crashed; a few laps later engine problems deprived Dan of what should then have been his victory. Two years later Dan returned to Brands Hatch for the Race of Champions to take a resounding victory in his superb Eagle-Weslake T1G, following this up with a dominant drive to win the Belgian Grand Prix. Dan was also comfortably leading the 1967 German Grand Prix when a driveshaft failed three laps from the finish. The months of May and June 1967 saw Dan at the peak of his powers as a driver for, apart from the Belgian GP success, he won Le Mans with AJ Foyt in a Ford GT40 Mk IV, the post-race celebrations going down in history as the first ever champagne shower as Henry Ford II received a soaking from Dan. Three years earlier Dan had already tasted success at Le Mans, winning the GT category and finishing fourth overall with Bob Bondurant in a Shelby AC Daytona Cobra Coupe. By 1970 Dan was coming to the end of his time in Formula 1 but he drove three Grands Prix for McLaren after Bruce’s death while testing the M8D Can-Am car at Goodwood. Dan also replaced Bruce in the first three Can-Am races of the year, winning two, before a fuel contract clash proved insuperable. In 1962 Dan first raced in the Indy 500 in one of Mickey Thompson’s innovative Buick-powered, rear-engined cars. For the following year he brought together Ford and Colin Chapman to tackle the race with Dan himself and Jimmy Clark as drivers of the Lotus Type 29. Against the traditional, old school Roadsters Jimmy finished second and Dan seventh. Dan never won at the Brickyard as a driver, his best results being second in 1968 and 1969, Bobby Unser winning in a privately-run Eagle in ’68. Eagles also won in 1973 (Gordon Johncock) and 1975 (Bobby Unser again). In total Dan the driver won seven Indycar races. Keen to try anything, Dan brought a Chevrolet Impala to Silverstone in 1961 to take on the dominant Jaguar 3.8 Mk 2s and kept them all behind him until a wheel collapsed. When he tried to run the car again later in the year, he was thwarted by a rival manufacturer’s machinations. However, he did win a British Saloon Car Championship race in 1963 at Oulton Park in a Ford Galaxie. He had his first taste of saloon car racing, NASCAR-style in the 1962 Daytona 500 and, when other commitments allowed, continued to race in these events until his retirement from driving, in particular winning five times at Riverside. In fact it was after the 1980 NASCAR race at Riverside, in which he was running third until gearbox troubles intervened, that Dan finally hung up his helmet. In Indycar type racing AAR Eagles won 22 races. Subsequently AAR enjoyed very successful programmes for Toyota in the IMSA series, Juan Manuel Fangio II taking the title in 1992 and 1993 including victories in both years in the Sebring 12 Hours and in 1993 in the Daytona 24 Hours. In total the AAR Toyotas won 26 events. In recent years Dan steered AAR towards various engineering projects in the aviation and automotive sectors and built and developed the limited edition Alligator motor cycle. AAR also played a part in the evolution of the radical DeltaWing sports-prototype. These words really only scratch the surface of the 60 year career of Daniel Sexton Gurney in motor sport. A fuller tribute will appear in the next issue of the BRDC Bulletin. In the meantime the BRDC offers its most sincere condolences to Dan’s widow Evi, their two sons Justin and Alex and his three sons Daniel Jr, John and James and daughter Lyndee by his first marriage. The funeral will be private.